Having fought with the ticket machine that was very complicated (credit card only and very slow), we paid the €3 for a ticket to open the exit barrier and escaped from La Couvertoirade. 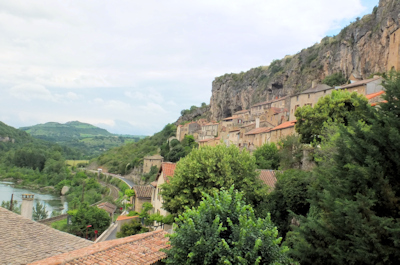 We drove through the picturesque Canyon de la Dourbie, passing the village of Cantobre high on a rock, to reach Millau, and took the road out to call in to the Viaduct visitor centre, then across the Tarn and a short drive to Peyre, another Plus Beau village, tucked beneath high cliffs. We drove up a narrow road to the parking area above the village, with good views across to the viaduct, especially as the sun was setting. We stayed at this peaceful spot overnight with one other motorhome. 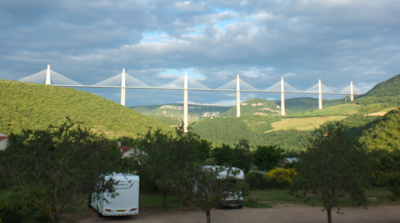 We decided to explore this area for a couple of days, so drove back to Millau and pulled in to Camping Larribal, an ACSI discount site alongside the river. After lunch, we wandered around the town then lazed in the warm sunshine. 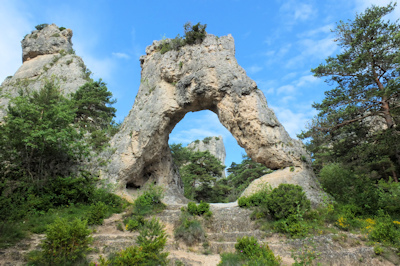 The next day we drove up a very long hill to the wooded plateau of the Causse Noir and eventually reached the Chaos de Montpellier le Vieux, an area of rocky outcrops overlooking the wooded hills and gorges. Feeling unenergetic in the 33 degrees heat we took the land train tour. The road down to the Tarn Gorge at le Rozier was winding and steep, and we didn't envy the many (mostly elderly) cyclists making the long climb up. 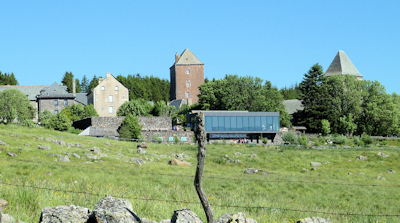 Continuing north, we took the empty free autoroute for twenty miles, and followed signs to the Stations d'Aubrac passing several pretty villages overlooking the Lot valley, and then the long climb from St Come d'Olt to the high moorland village of Aubrac, where we stayed overnight with several other motorhomes. The next morning we walked across the meadows, with a profusion of wild flowers including yellow gentian and wild violas, and called into the modern visitor centre. 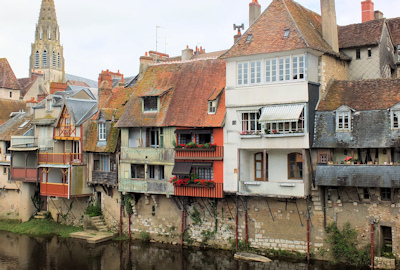 Taking the main road north, we passed Chaudes Aigues, where motorhome parking was banned except at the aire, and headed west to the Barrage de Sarrans on the River Truyere, and the small town of Mur de Barrez, with an interesting old centre, and a free aire. During the night we just managed to pick up Radio 4 LW and heard the disaster of the EU referendum result. 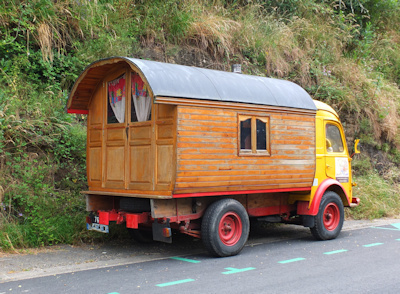 We then set off to Aurillac and stayed on the main roads, with good views across to the Monts de Cantal, heading north to Mauriac and Bort les Orgues, with its organ pipe rocks high above the town. 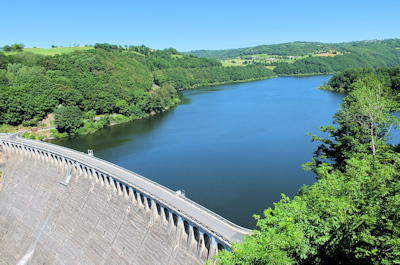 From there we continued to Meymac and the pleasant aire near the Lac de Sechemailles. Having driven over one hundred miles in a day we decided to explore the Plateau de Millevaches, a region of beech woods and peat bogs, for a couple of days and wandered around quiet lanes visiting the modern steel viewing tower at Mont Bessou, and pretty Chamberet with a small arboretum and lake, before reaching Treignac, where we visited a contemporary arts centre in an old factory, and watched a rather low-key village carnival parade. 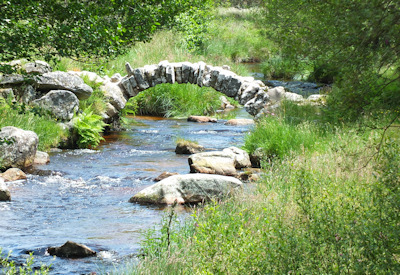 The next morning we drove on empty backroads to look at the Pont de Sénoueix, remains of a Roman bridge across a stream, somewhat smaller than we had expected, and enjoyed a pleasant walk beside more flower covered meadows. 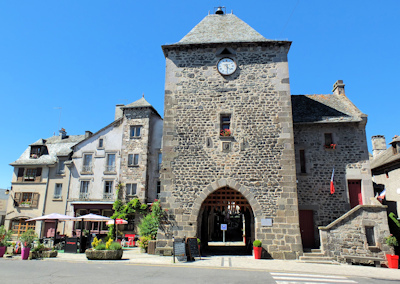 Returning to Gentioux Pigerolles, we took the road to Felletin and east across wooded hills and farmland to the small town of Crocq, with a castle ruin and museum in the tower, (closed on Mondays of course) and a chapel with famous tryptique paintings. 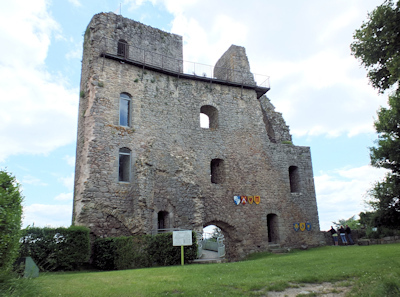 From there we drove to Aubusson, known for its tapestries, but found the new museum wasn't opening until July. 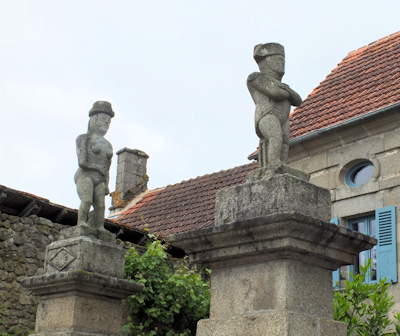 After a walk around the town centre, we took back roads to the tiny hamlet of Masgot, where there were several primitive granite sculptures dotted around the village, and continuing on an art theme, drove to the village of Sous Parsat where the interior of the church was covered in amazing modern colourful frescos by an artist in the 1980's. 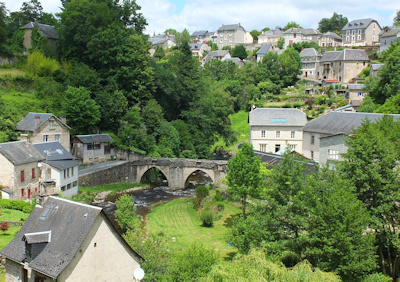 After a night at the free aire at Cresset, we drove up to the larger town of Gueret, then north towards the Creuse valley, turning off to stay at the empty municipal campsite at the artists' village of Fresselines. 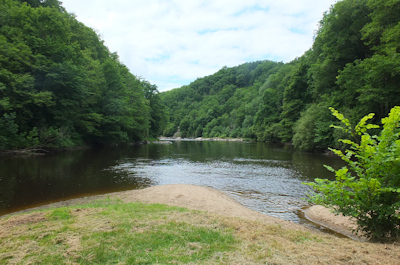 There were several art galleries, all closed until July, but we enjoyed a waymarked walk down to the confluence of the Creuse and Petit Creuse rivers, a famous spot painted by Monet, although he only stayed there for one spring. There were information panels explaining his way of working on up to thirty paintings at the same time, and he even paid someone to remove leaves from the trees as it affected the light shining on the river. 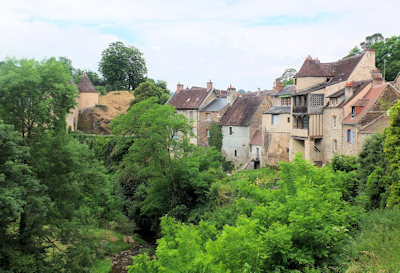 The next morning we drove through Crozant with its large castle then up to the picturesque village of Gargilesse-Dampierre, with houses and a large chateau perched on the cliff overlooking the river, and a church crypt with more frescos, these dating back to the Twelfth century. Nearby was another church decorated with modern murals at the village of Le Menoux. 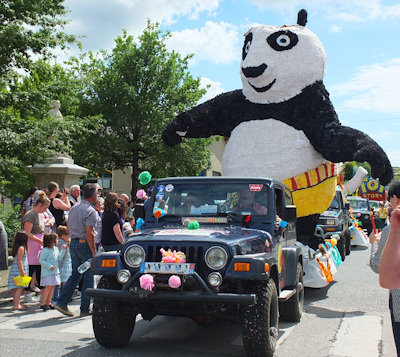 We stopped at Argenton sur Creuse for lunch and a short stroll, then continued along the Creuse valley to the village of Oulches and another free aire.